So now we are at the stage where the boy will eat veg. He has a real passion for peas, his podgy little fingers hone in on them, he rummages through the other vegetables and puts his pincer action into effect. 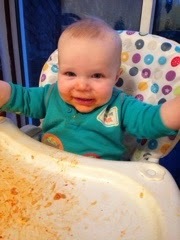 Carrots on the other hand he carelessly lobs over the edge of his white high chair tray without a care in the world. I can't get a bit of carrot in him, I don't know why! This is all rather reminiscent of his sister but she was a little less discerning at ten months old. 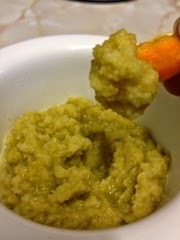 She also loved peas but would eat almost all other veg once the peas had been hoovered up. But how, oh how? ?, do I get my threenager to eat ANY vegetables. Seriously she can spot them from miles away and deems them worse than poison. If I threaten, cajole and plead, I still can't get her to even lick the ruddy things. Will this result in rickets, the most I get in her is a multi vitamin occasional (and those are the jelly sweet variety). I've tried hiding veg but seeing as she won't eat sauces (so tomato based sauces), she doesn't like pizza (I know, freak! ), and can't stand melted cheese (can't hide anything under that) what can I do? I give her the carrot and potato waffles but I'm not sure the health benefits, she eats the fish cakes with bits of veg in (only if she doesn't spot any, if she does then it's game over and nothing on the plate gets eaten as she eyes me suspiciously for the next couple of hours. I still put vegetables on her plate, sometimes she can ignore them and other times it encourages a full on tantrum and she cannot concentrate on the lovely food until I've removed the offending items. Hubby and I love vegetables and eat them with almost every meal. So how can I get her to eat them again, we have tried encouragement, reward charts and peer pressure (all failed) and I'm left panicking she'll develop some sort of condition from not getting enough. Her only saving grace is that she does like fruit and eats some with every meal. I'd like her to grow up a bit less fussy and also want to burn AK's books for showing photos of happy, smiling children with mounds of vegetables on their plates because in our house that'd induce a meltdown of epic proportions. Before Christmas I joined a great facebook group and blog Embrace Happy which aimed to share happiness and being thankful. Every day people share their three good things that happen and I was one of them. Then came a couple of gruelling months for me and I lost my happy. I haven't wanted to find three things because most of the time I've felt unable to do anything but wallow. I'm still not out the other side but I've started trying to share some happiness with others and every week I'm going to give a little kindness out. Obviously I'll try and do this all the time as a smile or holding a door open or a simple thank you is all you need to get started. But one day a week I'll concentrate on those I love a little more and post my results on the blog. I decided to keep it simple and last week I got my friend a card just to say hi and I was thinking of her as she's had a bit of a rough time lately. 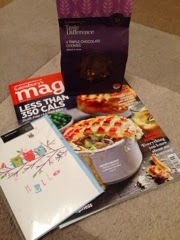 Then I got hubby some chocolate cookies (his favourite) as a treat and obvs couldn't leave myself out, I got the Sainsburys magazine as it had some amazing recipes in it which again I can share. So you see, it doesn't have to be big or grand gestures where lots of money is spent. Just the little bits of kindness and being thoughtful that hopefully will go a long way. ...since writing this my friend received her card and wrote a lovely text saying how it lifted her after a particularly hard day. It left me feeling warm n fuzzy so it's already working, give kindness and receive it back off the back of it. This is my first week of joining The little loves linky, I'm an avid follower and thought I'd take the plunge and have a go myself this week. This week for me it's been all about reading this lovely book. 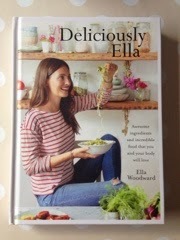 I'm in awe at how Ella changed her life, I love her blog anyway and if I can at least take on-board some of her healthy principles then it'll help me lose a few more pounds and get healthier. I'm so glad I did, the sequences are brilliant and simple to follow as a newbie. Nadia has such a soothing voice and mannerisms. I almost want to be her and wish I could come across as chilled as she does. So I'm going to also try meditating regularly to get my Zen. I've started fitting into a smaller size in clothes and it's such a buzz buying new things. 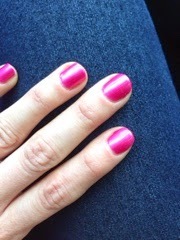 I've also started to take more care of myself and treating myself to new nails every couple of weeks, here's the latest offering, a lovely spring colour. Music has always been my thing but since having children I've not had time to indulge. In the car we have to listen to frozen soundtrack still so it was great whilst decorating our bedroom (I'm Chief Painter) that I listened to Taylor Swifts latest album (don't judge me), I really like how upbeat poppy she is ... If that's even a genre! Mostly this week we've been making a mess of the house. Half term is all encompassing and what with working too, it all got a bit hectic. But I did manage to make some hummus which was so simple and Slimming World friendly, it was so nice that I won't go back to shop stuff again. 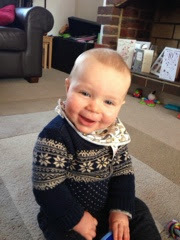 In two weeks time I'll be the proud owner of a four year old and then a month later my little man will be one. How on earth did that happen and who let them grow up! I'd better get a move on and start arranging their parties. 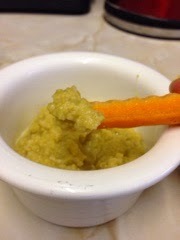 This is a great and easy little recipe, up until this point I've never made my own hummus as I thought it would taste horrible compared to shop brought varieties. I couldn't have been more wrong and the best bit is that this is a Slimming World friendly recipe. 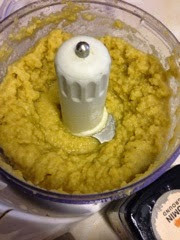 All you need is a can of chickpeas, garlic, lemon juice (1tbs), cumin (to your individual preference) and a blender. 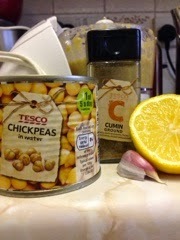 Cook the chickpeas and then whizz everything up in the blender. I added water to bind it together and some salt and pepper afterwards to taste and it was ready. There are great variations on this such as red pepper or add paprika instead of cumin (or as well as). I've seen other recipes using natural Fromage Frais but I quite like it slightly chunkier myself. I cut myself some carrot sticks and enjoyed this whilst the kids ate their dinners. It stopped me picking food I shouldn't. We used to find it easy putting Bubba to bed, we followed a routine that worked really well; bath, book & milk and then bed. This was how it went for a couple of years and I'd be downstairs again eating my dinner by 7.30pm. If she was unwell it sometimes went a bit wonky but on the whole I was fairly smug. 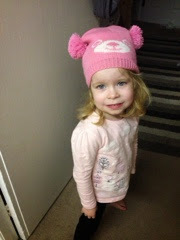 Then she hit her threenager year and her brother arrived on the scene and boom! It all went out the window. Crying would commence when I suggested it was time to head upstairs. Exclations of "but sleeping is boring mummy". After coercion and mild threats She'd then dawddle her way through getting her jimjams on, choosing books and drinking milk. Whichever way she could try and stall bedtime she would. Then came the "I want the light left on" so we got her a night light. Sometimes "I need water" would be a last ditch attempt at not sleeping. The "I want someone to stay in my room" followed which would result in a mighty meltdown if challenged. I slowly weaned her off this and eventually made my way out of her room over a week to where I would be sat on the stairs. Recently this slipped again and I'm back to sitting in her doorway whilst she goes to sleep which at the moment takes about five to ten minutes before she is fully asleep. I've been rather indulgent of late and faithfully sit there. I just don't have the energy (what with neither child sleeping that well presently) and also I'm really aware of how quickly time is slipping away from us. There will come a time that I'm not privy to every thought she has and she won't want me close. I'm on borrowed time and it's actually nice to take ten minutes to sit and listen to everything and nothing all at once. From her door I can hear both children snuffling themselves into dream land, I can hear silence beyond my watch tower. A silence that hasn't been there all day, it provides me with time to pause. I can think of things I want to do, how exhausted I feel and how lucky I am. It's probably not too long before I loose a little of my magic, when school starts properly I won't be the most important influence, there will be friends, teachers and new things she's learnt that will supersede me. So for now, if you want me at half past seven, I'll be here, sat waiting for my baby to fall asleep. How bad can that be! It's quiet again apart from the snuffling of my baby as he tries to sleep, it wasn't quiet a few minutes ago when he was crying. It hasn't been quiet for the last hour but right now all I can hear is the wind and rain outside. I strain my ear to make sure I can't hear his sister rustling around next door. I don't think he woke her up this time. My arm aches and one leg is going numb as I gently rock him and hold him close. His little podgy fingers grip on and then let go of my dressing gown rhythmically as his body is testing out and practising moving. He starts making those unbelievably cute little whale noises and talking to me. It's what he does when he's relaxed and trying to get to sleep, almost saying "oh this is comfy mummy, I feel sleepy, please carry on holding me". I've been sat in this chair for over an hour now and it's clear he is struggling tonight. I put him down and he cries out, desperate to sleep but something is stopping him. So I'm cuddling him, he needs me. This closeness, even at two in the morning, is blissful. I know I won't always be this lucky and although it's hurting my brain being awake, I'm trying to memorise how it feels and relishing that I'm lucky to be his mummy. I'm told all the time that this won't be forever which floods me with relief and despair. My children will grow up and become people that need me in different ways, no longer will I be able to solve it all with cuddles. But it's exciting to imagine them growing and seeing the world in their own eyes. Will they only call me once a week, once a month or when I call them. I can't bear the thought of not knowing where they are and who with. I'm suddenly aware that the boys breathing has deepened and he is finally asleep and I am torn between staying and holding him or putting him back in his own cot and potentially waking him again. The rain has stopped now and I feel more awake than ever as I gently place him in his cot, staying in close contact until he is finally resting. I can feel the warmth of where his head was laying and my arms suddenly feel lost as I head back to my own cold bed. Now the wait begins to see when I'll be up again to reassure my boy. 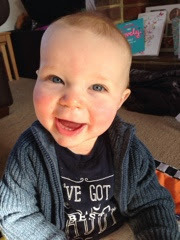 This is a smile I've rarely seen in the last few weeks, my boy has been ill. Or rather we think he is teething but develops a really runny nose, a temperature and is generally unhappy. He is usually such a happy and relaxed baby and I take it for granted. That is until he is teething or unwell, then it hits him really hard and also us. In the last few weeks we have been woken by him on average at least a couple of times a night. He doesn't settle at nap times and wakes crying or screaming after only a short while. Night times we have to either cuddle him back to sleep or spend hours trying to get him comfortable. We've ended up bringing him into our bed so we can all get some sleep, this is something we never did with Bubba. She has only slept in our bed once in all her time. It's caused me lots of anxiety, I'm so not good with change or lack of sleep. I become an emotional wreck, crying and feeling out of control. Evenings I become a ball of anxiety, any small cry and I'm fearing the worst and getting upset about it. The thought of getting even less sleep when we are already desperately in need of some sleep (any sleep) makes me feel ill.
On top of this the three year old is also waking at least once a night. She is usually convinced she is going downstairs (even in the early hours) and its a battle of wills to convince her to go back to bed. Unfortunately this is also the time where patience is lacking and tears are a plenty. Some nights it can become horrific with both myself and hubby up with a different child at different times. Two nights ago I was so tired that I put bubba back in bed and then rested my head on her bed (whilst on my knees), I woke 20 mins later face planting her bed with two dead legs and one arm. She had, it seems, got bored with me, gone to sleep and was gently snoring. 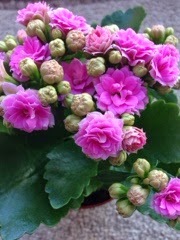 I semi crawled (dragging my arm and legs) back to bed and it woke hubby who thought something bad had happened to me! I really thought my girl should and would be consistently sleeping through by now but at the moment it seems really, really bad. Bad dreams and anxiety are our enemies right now. I'm not moaning as I know it's all only a phase but when you are in the middle of it, it's hard work. I'm only just hanging on and hoping we start to get some sleep off one or both children.